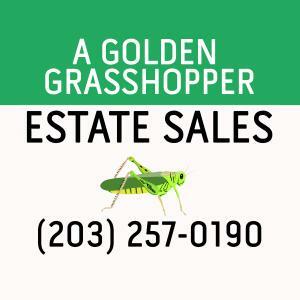 Whether you're setting a family estate, putting your own home on the market or simply want to streamline or redecorate, A Golden Grasshopper helps to sell your household items. Each sale is customized to address a customer's individual needs. Special emphasis is placed on achieving current market price for your most prized possessions, as well as selling items you'd just rather not pack, through an organized in-home sale to produce maximum results with minimum stress. The best pricing, promotion and presentation of your belongings leads to the most successful sale, putting items in the hands of buyers who will appreciate them for years to come. HUGE Estate Sale in Stratford - Mid Century + Men's Collectibles - Civil War to Today! Exceptional Moving Sale in One of Trumbull's Most Desirable Neighborhoods May 11-12, 9a.m.-4p.m. Trumbull Professional + Artist are Downsizing! Moving Sale March 23-24, 9a.m.-4p.m. Easton Moving Sale - 3 Minutes from the Merritt! Weston Estate Sale - Don't Miss This One! 5/5 and 5/6, 9a.m-4p.m. TRUMBULL MOVING SALE BY BUSY BEE ESTATE SALES 7/8, 7/9, 7/10 9 a.m.- 3 p.m.